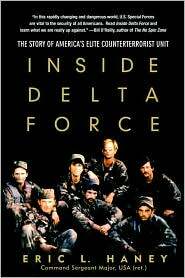 This is the story of building Delta Force, an elite group of military personnel who passed through more than rigorous challenges in order to qualify for a force to be entrusted with national defense at the highest levels. The author details his personal experience from being selected in the second tiny group of soldiers for this unit, going from the elation of being selected to the grueling ordeal of qualification, plus amazement when the few winners saw how many of their colleagues had quit or met with rejection. As you read his story, watching Delta Force being assembled from scratch, you will identify with the group and its purpose, and surely admire the almost impossible accomplishments the group achieves every day. Haney spares us nothing as he shows the disastrous failure of a helicopter raid to free US hostages in Iran. He takes us “behind the lines” as we see clandestine assignments in US cities as well as undercover assignments overseas. In fact, one is left to wonder how Haney ever got permission to reveal so much about the elite group. Reveal he does, and I heartily recommend the experience of reading this action-packed nonfiction novel.